Cold and Flu season is here and today I wanted to share the 7 simple steps I take to help prevent common cold & flu in our house. Nothing is worse than having sick kids, believe me! I currently have 3 kids in school, 2 in elementary and 1 in middle school, so they are exposed everyday just by being around all the kids. Also my middle child Maddie was a micro-preemie born at 24 weeks and we had years and years of chronic colds and hospital stays that ended up requiring oxygen, inhalers and prescription medication. So cold and flu prevention has always been high on my list as a parent, especially in the last 8 years. *I want to preface this all first by saying, I am not a Doctor, Nutritionist, Wellness Expert, etc.. I am a Mom who strives to raise healthy kids, plain and simple! *There in no particular order. 1. Washing Hands & Antibacterial Wipes. Experts state that the first line of defense during cold and flu season is to simply wash your hands! According to an article published by WebMD You’re supposed to wash your hands with warm water & antibacterial soap for at least 20 seconds while rubbing your hands together. I put these wipes in my kids’ backpacks and lunch boxes and remind them all the time to wipe their hands before they eat. Of course it’s brought on by the, “I know, I know-mom…wipe our hand before we eat…” I may bother them now but they will appreciate it later! I have been very diligent with giving my kids their vitamins and an immune system supplement for years. Especially during the school year. Over the past few years I have regularly used Olly as one our go-to brand and in the last month changed it up to using Nature Made. These are two of our empty bottles of Olly supplements, just to show you that they’re apart of our “empties” and we do actually use them. I still would recommend Olly brand to anyone looking for a good recommendation but, when it came down to price and how many vitamins I was giving to them according to instructions we were going thru them too fast and I wanted something more affordable but with the same punch or better. That’s when I made the switch to Nature Made. I may go back to Olly, but this is what we’re using right now. Here’s what the kids were taking 2 years ago! I know this is a very polarizing topic, some swear by the flu vaccine and some swear that when they get the vaccine they still get sick. I am not here to sway you either way but, we get the flu vaccine. During the winter months and really all year I’m always after the kids about drinking water and staying hydrated. Nutrition and eating right is a huge immune system support and one of the ways I like to get extra veggies in the kids during the winter months is by making soups. 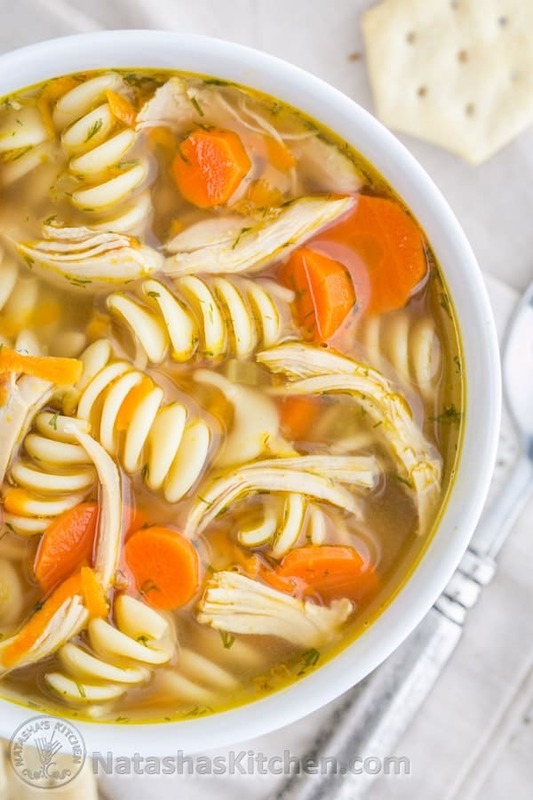 Here’s a great Chicken Noodle Soup recipe by Natasha’s Kitchen. Well I read a great article, published by BodyEdology.com talking about the benefit of having soup Chicken Noodle soup while sick and the overall benefits of soup in the winter month, you should give it a read! Anyone who knows me knows, I am a HUGE advocate for sleep and my kids have a healthy sleep routine. My sister jokingly says that I give my kids Benadryl to have them sleep so good, lol! But just to clear that up, my kids don’t get sleepy if they are given benadryl, ha so that wouldn’t work anyway! Sleep is so important for kids in terms of health, their attitude and for their growth. Get your kids on a sleep routine and it with save some of your sanity as a Mom! 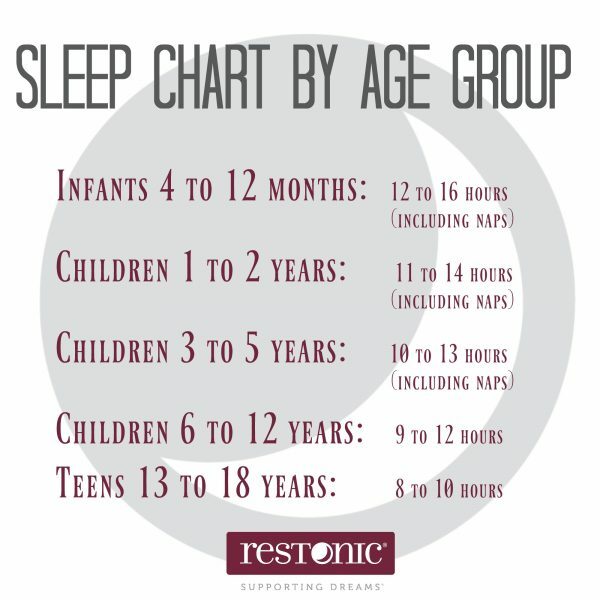 Here’s a chart and a great article by Restonic, on the importance of sleep and how it correlates with kids. Physical activity in kids is important because it strengthens their lungs, strengthens their heart muscle and can help shorten the length of a cold if they’re normally physically active. My kids love to ride bikes, ride scooters, go on walks, jump on the trampoline, and swim, those are all great activities to keep your kids active & healthy. It also benefits their mental health too! Here are two great articles by, parents.com & HealthyFamiliesBC that talk about the importance of physical activity, how it pertains to our kids’ health and cold & flu season. This is something I do and I don’t have any research to back this up but, I like to keep my house’s thermostat at 68-70°F during the winter months. I personally think when the heater is on any higher your nose starts getting dry & stuffy, you can wake up with a sore throat and it’s not comfortable. Those are my 7 Simple Steps that I do to help prevent the common cold and flu in our house. Let me know some of the things you do in your house to keep you and or your kids healthy during cold and flu season!